Cardano is a decentralized public blockchain and cryptocurrency project and is a fully open source project. Cardano is developing a smart contract platform which seeks to deliver more advanced features than any protocol previously developed. It is the first blockchain platform to evolve out of a scientific philosophy and a research-first driven approach. The development team consists of a large global collective of expert engineers and researchers. This is the first blockchain project to be developed from a scientific philosophy, and the only one to be designed and built by a global team of leading academics and engineers. It is essential that the technology is secure, flexible and scalable for use by many millions of users. Consequently, considerable thought and care from some of the leading experts in their fields has been devoted to the project and informed design decisions. The scientific rigor applied to mission-critical systems such as aerospace and banking has been brought to the field of cryptocurrencies, with a high assurance implementation. 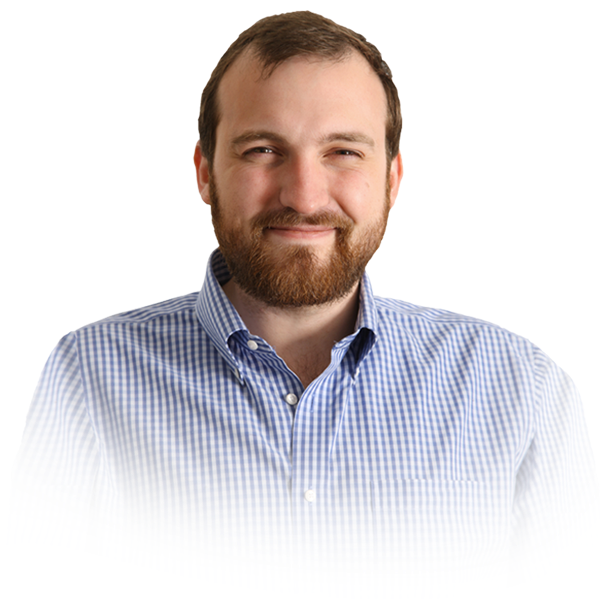 Charles Hoskinson is a Colorado-based technology entrepreneur and mathematician. He attended Metropolitan State University of Denver and University of Colorado Boulder to study analytic number theory before moving into cryptography through industry exposure. His professional experience includes founding three cryptocurrency-related start-ups – Invictus Innovations, Ethereum and IOHK – and he has held a variety of posts in both the public and private sectors. He was the founding chairman of the Bitcoin Foundation’s education committee and established the Cryptocurrency Research Group in 2013. Aggelos Kiayias is the chair in cybersecurity and privacy at the University of Edinburgh. His research interests are in computer security, information security, applied cryptography, and foundations of cryptography with a particular emphasis in blockchain technologies and distributed systems, e-voting and secure multiparty protocols, as well as privacy and identity management. Amanda grew up and graduated in Switzerland and since worked in the Financial Industry in various roles. This included administration, office management, executive assistance and marketing management. She feels very passionate about excellent customer service and has gained wide knowledge in the South African short-term insurance sector while consulting private and corporate clients at a reputable brokerage for several years. Tilmar Wilhelm Goos is a Swiss based international tax and business specialist. He has nearly 10 years’ international experience and has been working in China, Mexico, the Netherlands, and Portugal. Tilmar holds a BBA degree in International Business & Mandarin Chinese as well as a LL.M in European and Trans global Business Law & Taxation. His current Ph.D research focuses on the tax & legal issues of the Digital Economy. Juliette started her career in the insurance industry doing performance analysis and training development for new personnel. She continued her development in roles that have included corporate administration and office management. Having a service oriented background, Juliette has a keen interest in event management and project coordination for blockchain related projects. She graduated from the University of Johannesburg with a BTech Degree in Hospitality Management. Steve joined the Cardano Foundation having recently managed operations for an asset manager in Zurich focusing on fund administration, compliance, regulatory matters and IT. As a technology enthusiast, he developed a natural interest in blockchain technology and decentralised application development. Steve graduated from the university of Cape Town with a degree in Geomatics engineering. Ye Ji is a management professional who has had the experiences of working with various stakeholders from startups to government officials. Ye Ji graduated from Yonsei University with a BSc degree in Political Science and International Studies and also a candidate for MSc Management of Information Systems and Digital Innovation in London School of Economics and Political Science. Lei is an academic and strategic advisor specialising in technology and business. Lei received his PhD in Media and Communications from Goldsmiths, University of London. He has a diverse professional and academic background in the humanities and ICT. His analyses are informed by empirical research on the intersections of emerging technologies, human behaviour, risk, ethics, governance, entrepreneurship and innovation. His current focus is on the implementation of blockchain technology. Maki is a marketing professional who has had the opportunity to work in a number of diverse industries. Maki graduated from Queen’s University with a BSc Hons. degree in Biology and Environmental Science and also holds a Master of Business Management from University of British Columbia. Having a dual degree in science and business has given her the analytical foundation to come in and learn about blockchain technology that will help better serve the Cardano community. Jon helps businesses and organisations to be more successful through a better understanding and use of marketing, community and technology. He is the Founder of Hull’s Tech community and also ran East Yorkshire’s tech conference HD Live. He is also the Co-Founder of the C4Di - Centre for Digital Innovation. He has lived in Italy, Asia and Australia and now resides in the UK. Jon graduated from Cardiff University with a BCS in Physiology. Pascal graduated from the University of St. Gallen in 2004 with an M.A.HSG in Finance, Accounting and Controlling. He aquired many years of well-founded professional experience as a finance expert, especially in companies with IRFS and USGAAP reporting requirements. Pascal joined the Cardano Foundation as Swiss foundation council member.